You weren't expecting to actually see the end of the TV Pilot, were you? No, silly! 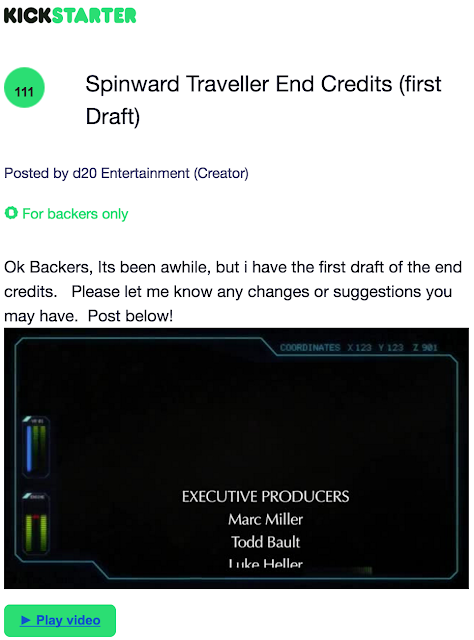 This is about the End Credits for Spinward Traveller. You know, the part when you are at the movies you walk out on in the rush to get to the bathroom before the line forms. Yep, that's our Kenny. Always rushing to get things finished, even when they aren't hardly even started. Oh, you so silly Kenny! Next you'll be showing the opening credits. Then, maybe the sound clip of a blaster rifle cribbed from some 15 year old sci-fi show. Are you sharing notes with Gareth? He was going to go all "transmedia." Maybe you could do the closing credits for Far West. Sure it's a game book, but with all of your experience making pencil dice (or rather, making money from selling nonexistent pencil dice) you two are a natural fit. "Hi Guys. We have no show or movie, but check out these awesome credits with our names in them!" Gosh someone post about a class action suit and end credits appear but nothing else. Can you do the end credits when you haven't completed the pilot yet? Isn't it likely with a greatly delayed project that people will be swapped out as they find better things to do than wait? Everything is just a delaying tactic....just a way to kick the can down the road some. Usually Kenny is feeling some pressure and does something like this to relieve some of it. Omigawd -- the characters are still "Port Raided" in the credits. LOL. Longest ongoing uncorrected typo ever.